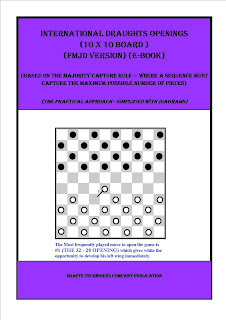 To test run this integration, we have chosen the "Openings of the Game" We therefore dedicate this presentation to All International Draughts Players for both the World Draughts Federation (FMJD Variant) and The Mirrored Board Variant that is played in Nigeria, Ghana, and some other African Countries. This presentation for The Opening of the game, is simplified and explained, with practical diagrams and illustrations. 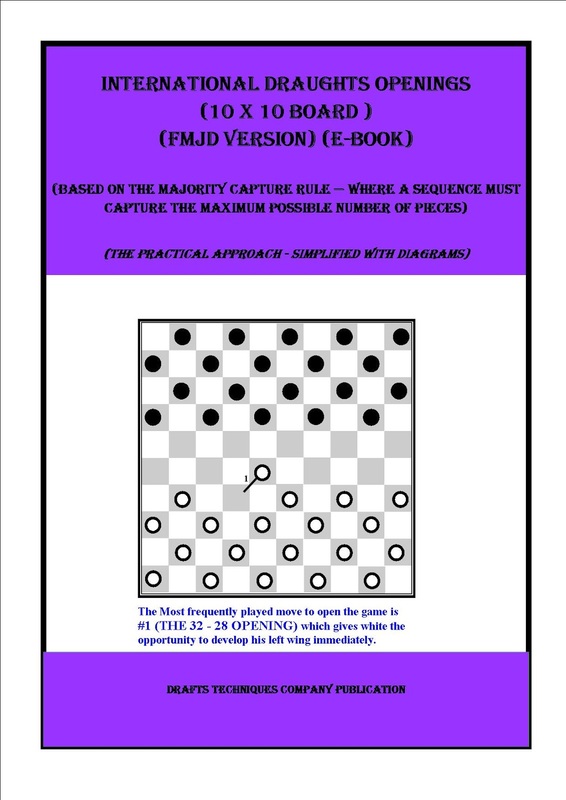 We present to them the simplification of "The Openings of the Game" based on the Majority Capture Rule - Where a sequence must capture the maximum possible number of pieces. With practical oriented diagrams/illustrations. You could access the complete FMJD Rules here. (See The preview of the E-Book Here). TO PURCHASE THIS E-BOOK, (Click Here). 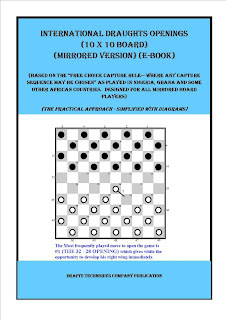 We present to the African Players or indeed ALL MIRRORED BOARD PLAYERS, the simplification of "The Openings of the Game" based on the "Free Choice Capture Rule - Where any capture sequence may be Chosen". With practical oriented diagrams/illustrations. You could access the Comprehensive Rules here or the Abridged Rules here. 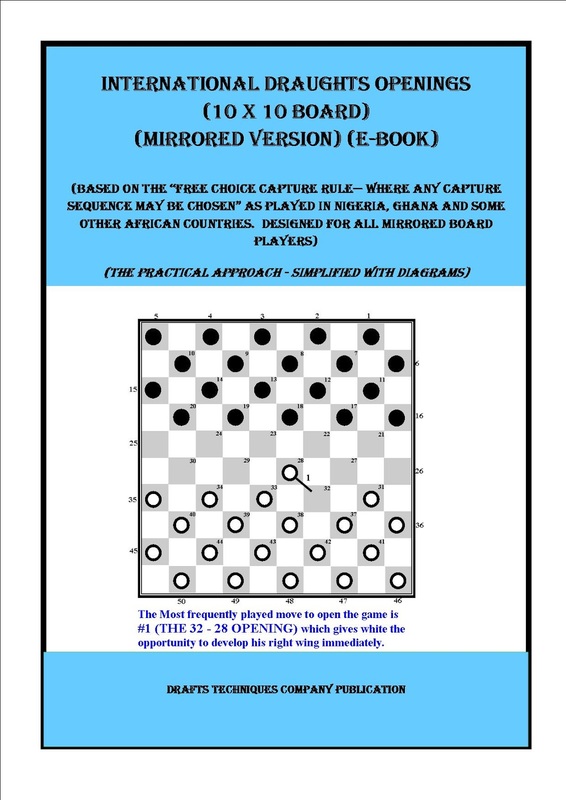 (1) To Align the Mirrored Version (As Played in Nigeria, Ghana and some African Countries or indeed all countries that use the "Mirrored Board" all over the World) to have the same notations as the World Draughts Federation (FMJD Version). Using the FMJD numbering system will open All Mirrored Board Players to thousands of books and magazines to enable them study hundreds of thousands of games and positions. (2) This proposed notation will open players to incredible heritage, promote quick study to catch up to world level. (3) It is also to make players to know the International recognised names of the games which they already know/play from time to time. To know the various openings and how to play them correctly. (4) The uniqueness of our presentation will enable players to learn the notations unconsciously thereby becoming masters of them. (5) There will be no more need to constantly translate from one numeric system to another. Wow! Great job! You made the openings so easy to understand. Kudos to you and your team. We thank you for your compliments.